Another MozCon has come and gone. This year, a few of our team members here at Dealer Teamwork were given the opportunity to travel to Seattle, WA to attend one of, if not the biggest events in the SEO industry. We learned a lot and met a ton of great people in SEO from the auto industry and beyond. It was interesting to discuss the digital marketing obstacles companies can face in 2018, whether they be similar or different from what we see at Dealer Teamwork every day. However, the biggest benefit we got at MozCon was, by far, the information we learned which we can bring back to our dealers. Hopefully, what we learned and what we talk about today will have a positive impact on the success of our clients. With that being said, let’s dive right in. The Top 5 Takeaways from MozCon 2018. The theme of Rob Bucci’s (@STATrob) session was that Google may be deciding local intent for the user, whether that user likes it or not. Before we get into the evidence behind this, we should establish the difference between Geo-Location and Geo-Modification. Geo-Location is when the searcher’s device provides location data as part of a user’s search query, whereas geo-modification is when geographical terms are included in their search – i.e. …near me, … in (city), etc. Using base keywords with geo-modifiers and geo-locators isn’t a new idea in SEO, but Rob was able to show some interesting data in how Google implements these in the Local Pack and on a SERP. If we dive in a little further, we find that there is quite a bit of variation in results presented in the Local Pack for the same using these geo-modifiers from different zip codes. The example Bucci used in this presentation can be seen below. What does this mean for auto dealers? It means that you should investigate where your store(s) display in the Local Pack when using these common geo-modifiers. Dealers can also use this as an opportunity to evaluate their keywords. Any digital marketer knows the benefits that a healthy list of relevant, optimal keywords can have on a business’ SEO. However, the old way of evaluating keywords can sometimes be slow and ineffective since any website could possibly be bidding on thousands of keywords at once. Leveraging huge sets of data at once can have many benefits to a company, such as identifying new options for growth that previously weren’t as visible in our evaluations. The problem is: the tools that we have traditionally used to leverage big data, have not been able to perform to the standards that we need. Wil Reynolds (@wilreynolds) from Seer Interactive gave a passionate session advocating the implementation of Power BI to conduct keyword analysis. By using Power BI to evaluate 1 million+ keywords and which companies are bidding on them, he was able to identify over 70,000 competitors, or companies bidding on the same keywords, to his client. According to Wil, conducting this sort of analysis would take him and his team months with their old processes, but using tools that can handle big data sets, like Power BI, they were able to cut their turnaround to a few hours. This should come as no surprise. SEO was built by bots crawling, indexing and ranking sites. We are now far beyond the point where a human can evaluate the quality of search results better than a bot. Bots have always been the driving force of SEO, and they are only getting smarter. Are all great ways to help ensure your pages are continuing to rank organically. Another topic that shouldn’t come as a surprise to most is that mobile is king. However, we are seeing more and more from Google that they are prioritizing zero click searches as much as they can on mobile. If you do a standard search on Google today, chances are that rather than paid or organic links, the top fold consists of direct answers to the search, videos, carousels and the knowledge graph. These are entities that are designed to answer the search intent instantly, without requiring the user to click a link. The best way to stay on top of this is to continually search for your products on mobile, and see what comes up. If these entities appear above your organic links, you may want to prioritize getting your products and services to display within these entities. While there were many changes covered at MozCon there was a least one idea that has remained consistent over the years: Putting yourself in the shoes of your searchers is still one of the best ways to get results. One could argue the philosophy and tactics behind advertising in the 20th century until the sun goes down. But there is no denying that customers have more power with their purchases than ever before. They have access to all the information they could ever need directly at their fingertips. We need to be sure we are giving them the right information in the way they want and how they want it. Using empathy continues to be the best way to answer the searchers intent, at least for now. 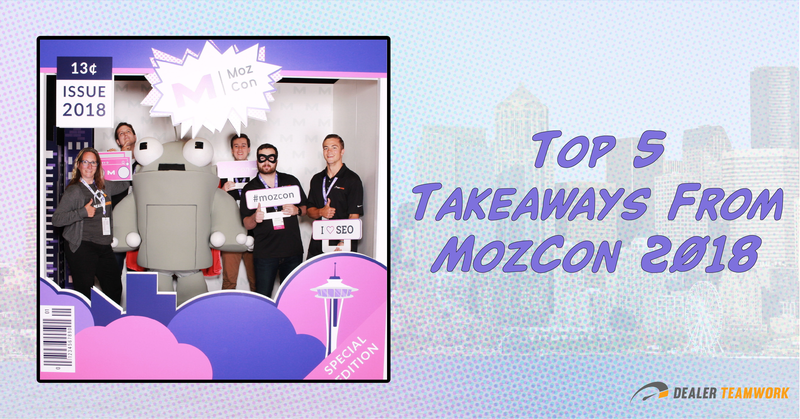 We will be going more in-depth on these topics and more from MozCon in the coming weeks. Follow us on social media (Twitter, Facebook, Linkedin) or subscribe to our email list to stay on top of the latest SEO tactics and news about the MPOP™.